This study investigated the childhood autism rating scale (CARS) as a tool for ASD diagnoses for 2-year-old (n = 376) and 4-year-old (n = 230) children referred for possible autism. The cut-off score to distinguish autistic disorder from PDD-NOS was 32 in the 2-year-old sample (consistent with Lord in J Child Psychol Psychiatry Allied Discipl, 36, 1365–1382, 1995), and 30 in the 4-year-old sample, with good sensitivity and specificity at both ages. The cut-off score to distinguish ASD from non-ASD at both ages was 25.5, with good sensitivity and specificity. 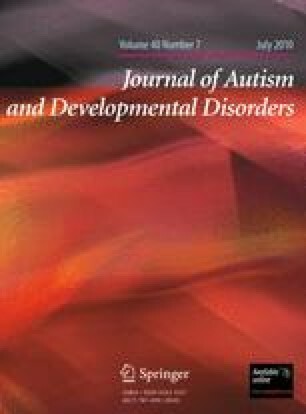 Results confirm the utility of the CARS in distinguishing autistic disorder from PDD-NOS, and distinguishing ASD from other developmental disorders and typical development and suggest that an ASD cutoff around 25, which is in common clinical use, is valid. We would like to thank all the children and families who participated in our study. We gratefully acknowledge the assistance of participating pediatricians and staff in their offices, as well as providers in the Connecticut and Massachusetts Birth-to-Three Early Intervention systems. We would like to thank Jillian Wood, Executive Director of the Hezekiah Beardsley Chapter of the American Academy of Pediatrics, who assisted in recruiting participating physician offices and promoted the study state-wide. We would also like to extend sincere thanks to members of the Early Detection Advisory Board, especially Ho-Wen Hsu, M.D., and Mark Greenstein, M.D., for their wise advice and support. Clinicians Thyde Dumont-Mathieu, Sarah Hodgson, and Jamie Kleinman, graduate students Hilary Boorstein, Alyssa Verbalis, Katelin Carr, Lauren Herlihy, and Kelley Knoch, and our dedicated undergraduate research assistants were invaluable in conducting all aspects of the study. This study is supported by NIH grant R01 HD039961 and Maternal and Child Health Bureau grant R40 MC00270 and prior grants from the National Association for Autism Research, NIMH, and the Department of Education. This paper was prepared from the masters thesis of Colby Chlebowski at the University of Connecticut.